Throughout the semester, we were able to cover various topics in my Art and Christ class. As we read and reflected on our own beliefs and how they are applied to art, we were challenged and learned a lot about what it means to be an artist of faith. One of the most rewarding conversations that we had was our discussion with Brother Andre from Mt. Angle Abbey. 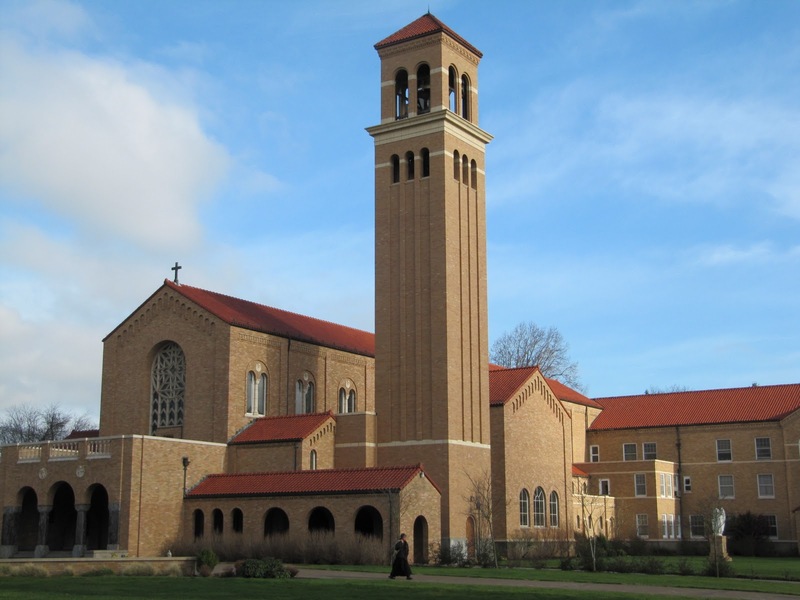 Brother Andre shared about the art collection at the Abbey and what it looks like for Catholics to create within the church. We discussed about iconography and how it is a form of worship and the various guidelines within the art. I also thought it was interesting to find out that a lot of iconographer’s work goes unnoticed because they do not include their names on the art. When asked what advice he had for art students of faith, Brother Andre shared something that still resonates with me today. What he shared with us that day, I feel sums up much of what I gained from this course. He told us to “STAY TRUE.” Stay true to your prayer life and your relationship with God and you won’t go wrong with Him as your counsel. I have found this to be true in my life in various areas. This semester, at the beginning of each class our professor would have us contemplate on a work of art related to the day’s discussion. After a few minutes of quiet contemplation he would ask us to share a word and all of the class’ words were read back to us. I found this exercise rewarding and very insightful. I loved seeing how each person would interpret something different, or more so often similar words. For my final project, I decided to create my own work of art that reflected Brother Andre’s words, and hopefully serve as a reminder to myself and a source of contemplation for others. I decided to style my drawing after american traditional tattoos. This was a popular tattoo style among American Navy sailors during World War II. This style is distinguished by its use of outline and bold use of blacks and solid colors. I chose this style because Brother Andre was the first Catholic monk I had ever seen with the most tattoos and it is one of the most basic forms of the art of tattoo. 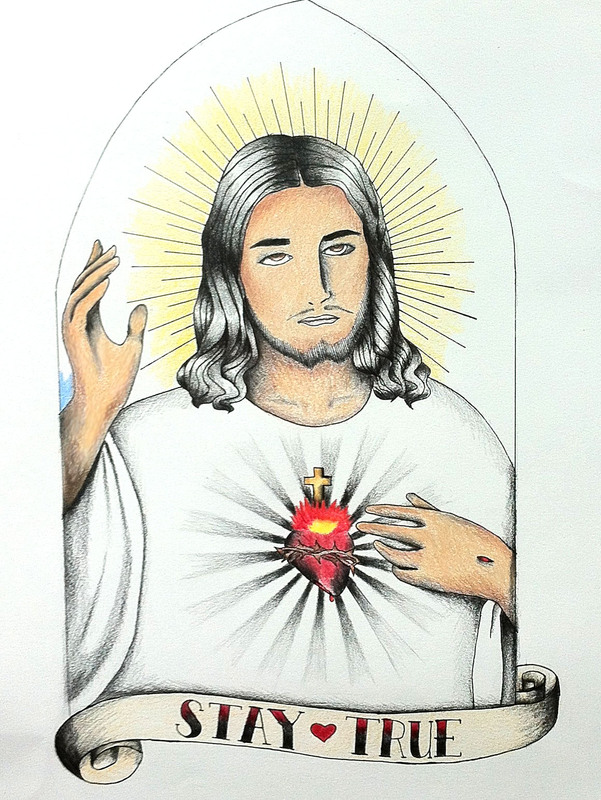 I also chose the particular Catholic image of the Sacred Heart of Jesus. 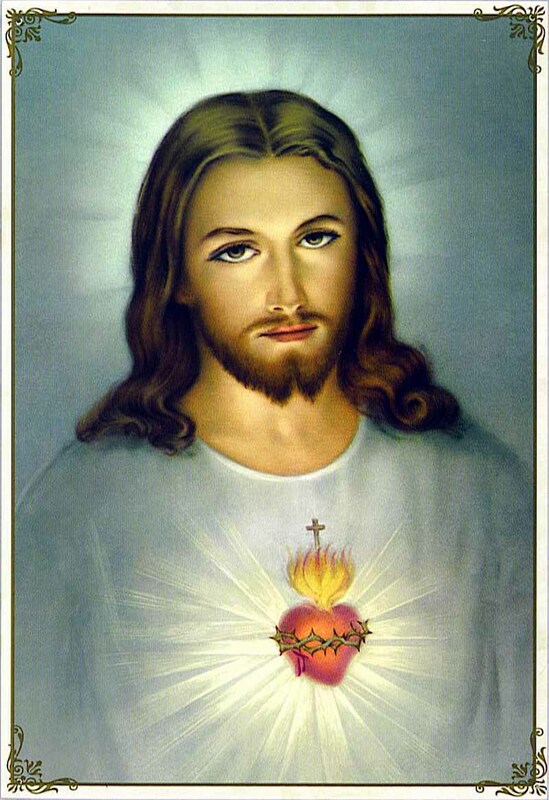 The Sacred Heart of Jesus was first a vision that appeared to Catholic nun, Margaret Mary Alacoque on December 27, 1673. Today it is used as a form of devotion on God’s love for the world. This was a piece that I grew up with as a child. Grandma had various Catholic images around her house and this was one that always brought conviction to my mischievous seven year old self. It is also a great reminder to me of where my roots are, as it reminds me of my grandmother and my culture that she represents, and my Catholic roots. Lastly, I chose to do a drawing rather than a digital rendering of the image because it was a reminder of what it felt to go back to my basic training in the arts. I really liked how you integrated two very disparate elements (tattoo and icon) into one cohesive image. Moreover I really like the time, effort and thought you put into this project. Your response here is thoughtful and insightful. I’m glad the experience at the abbey was such a good one for you. I would like to see if you end up developing this image any more and what you may come up with. Really wonderful having you in class, hope you have a wonderful and restful break!